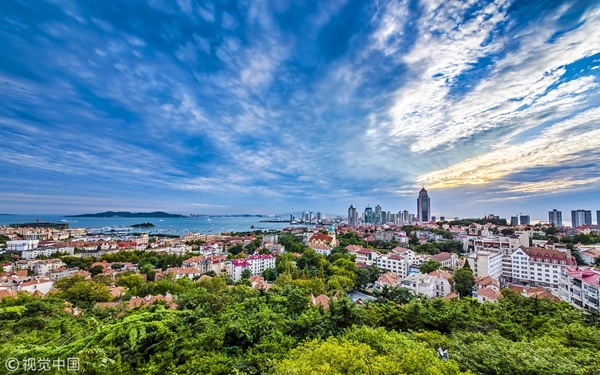 The coastal city of Qingdao in Shandong province is widely regarded as having one of the most beautiful natural bays in China, offering a vast range of activities for residents and visitors to enjoy. Since it hosted the sailing events during the 2008 Beijing Olympic Games, the popularity of marine sports has flourished in the city, in particular among tourists. In March, the Clipper Round the World Yacht Race was held in Qingdao for the seventh consecutive year. Other world-class races such as the IASF Sailing World Cup, and well-developed races like the City Clubs Open Regatta International, have further pushed sailing in the city onto the global stage. During a previous interview with China Daily, Robin Knox-Johnston, founder of the Clipper Round the World Yacht Race, said he has witnessed firsthand the development of yachting facilities in the coastal city over the past 14 years. 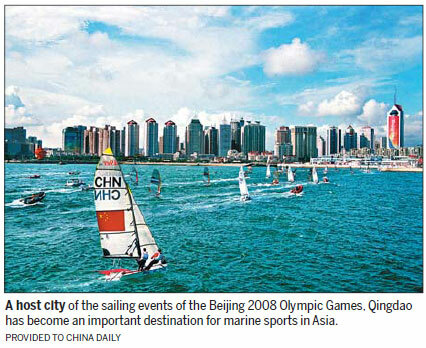 He said that Clipper's close cooperation with Qingdao has helped popularize sailing in China. The sport requires strict training and accumulated experience at sea. Qingdao Olympic Sailing Center, one of the arenas for the 2008 Beijing Olympics, has been refurbished to become the venue for the Shanghai Cooperation Organization Summit. Eco-friendly materials have been used to build facilities that can be moved later, to guarantee sustainable development after the event, according to the local government. The city welcomed more than 88 million tourists in 2017, of which over 1.4 million were from overseas, an increasing number as Qingdao continues to grow into a tourist destination for foreigners. Besides sailing, Qingdao is also known for its beer. 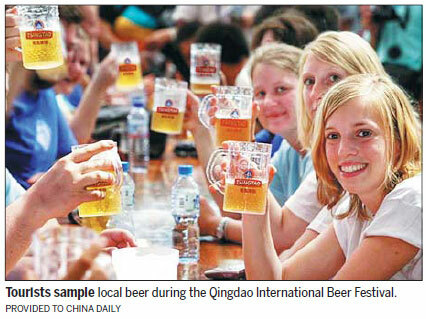 The 27th Qingdao International Beer Festival held last year carried a musical theme. The event attracted over 4.2 million attendees, who made their way through 3,000 metric tons of beer, according to the organizer. The beer museum, located on Dengzhou Road in Qingdao, is the first of its kind in China and displays 100-year-old facilities as well as modern equipment used in beer production. Since opening to the public, the number of visitors has surpassed 6 million, bringing in profit of 1.2 billion yuan ($187 million). The development of tourism in Qingdao has a strong emphasis on globalization, in both the building of global brands and the improvement of quality and standards. The city has over 200 old buildings built in the late 19th and early 20th centuries. They feature architectural styles from some 20 countries, including Germany, Russia, the United Kingdom, France, Japan and the United States. In the summer of 2017, a number of modern restaurants, art galleries and cafes opened in historic areas, adding a modern stylish touch to the old buildings. China's emerging cruise ship industry has become more popular in recent years, offering tourists something different from how they've gone on vacations in the past. Qingdao has invited 39 experts from home and abroad to give advice on the development of the cruise tour industry, to learn from the city of Miami in the US, Southampton in the UK and Barcelona in Spain. The cruise port of Qingdao has opened routes to Japan, South Korea and Russia, and since 2015, the port has welcomed some 230,000 outbound and inbound passengers. The cultural industry is another highlight of the city's tourism growth. It organized the fifth FIAP Photo Meeting in August 2017, welcoming 300 photographers from 42 countries and regions to take photos in the city. A world-class association was established among countries involved in the Belt and Road Initiative during the event. The United Nations Educational, Scientific and Cultural Organization honored Qingdao as a City of Film in November 2017, the first Chinese city to receive the honorary title. Every year, over 200 movies are shot in Qingdao. In April, the Qingdao Oriental Movie Metropolis was completed with a gross investment of 50 billion yuan. It is an advanced film cultural park with 52 high-tech studios and the world's only indoor and outdoor water studios. The complex is also home to theaters, theme parks, hotels and marinas. A movie festival featuring 30 film-related events will be held in the movie metropolis during this year's SCO Summit, with representatives, artists and company executives expected to attend. Yuan Meilin, chairman of Qingdao West Coast Cultural Industry Investment Co, said: "The movie festival can help promote Chinese movies to go global and foreign movies to enter China."